The future doesn’t belong to the fainthearted, it belongs to the brave. Rediscover the values, spirit and legacy that thrives at The Reagan Library. Buy your tickets online today. Become a friend of The Reagan Foundation and make your own mark in history. Membership matters. Get more information about visiting the Reagan Library, including pricing, purchasing advance tickets online, touring the Museum, dining at the Library and parking. The Museum is open daily between 10:00 a.m. and 5:00 p.m. (Christmas Eve closing at 3:00 p.m. | closed only on Thanksgiving Day, Christmas Day and New Year's Day). Become a member now and enjoy free admission for a year, exclusive Members' only pricing to world class exhibitions, discounts at our Museum Store and so much more! The Ronald Reagan Presidential Foundation is a not-for-profit 501(c)(3) tax exempt organization under the IRS Code, sections 509(a)(1) and 170(b)(1)(A)(vi) and as such contributions are deductible as described therein. The Ronald Reagan Presidential Library and Museum is proud to present The World of da Vinci, featuring rare folios of the authentic, 600-year-old Codex Atlanticus. Come discover the true Leonardo da Vinci through these sources of inspiration: a workshop of ideas and designs for everyone. This remarkable exhibition features over three-dozen reconstructions of Leonardo da Vinci’s fantastic machines, including over a dozen that are built life size including his Mechanical Lion, Flying Bicycle, Mechanical Bat and Great Kite. The Ronald Reagan Presidential Foundation encourages the pursuit of education and self-improvement by awarding scholarships to extraordinary young leaders. Spend a semester in the nation’s capital with students from around the country and the world who are just as passionate about making a difference through strong leadership. The intensive and immersive schedule is designed to maximize your time in Washington by combining learning in the classroom with practical internship experience and special events with prominent public leaders. Leadership and the American Presidency (LTAP) will help you define and strengthen your leadership skills and learn lessons from the American Presidency, all while giving you an insider’s view of Washington. The Reagan Library rests on a majestic hill overlooking the breath-taking views of Southern California. It is one of the Southland's most stunning event locations, and a perfect destination for your next special event. 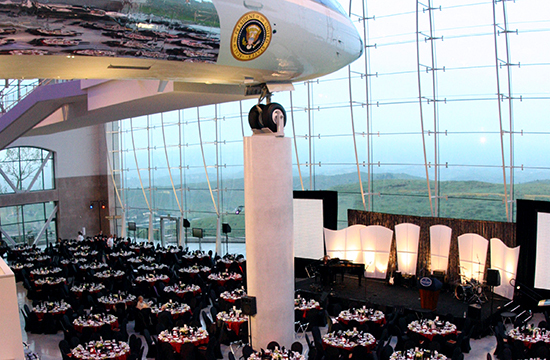 With rooms and outdoor venues capable of hosting intimate meetings for 10 or gala dinners for up to 1,500 guests, The Library offers a diverse selection of memorable settings, from the mission-inspired elegance of the main library building to the sleek, modern grandeur of the Air Force One Pavilion.